Two secondary options are specified in parentheses after the NORMAL primary option. The PERCENTS= option specifies quantiles, which are to be displayed in the "FitQuantiles" table. The MIDPERCENTS option requests a table that lists the midpoints, the observed percentage of observations, and the estimated percentage of the population in each interval (estimated from the fitted normal distribution). See Table 4.6 for the secondary options that can be specified with after the NORMAL primary option. 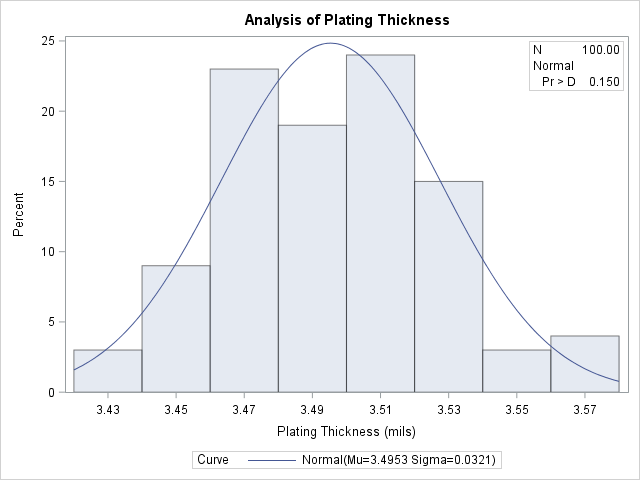 The histogram of the variable Thick with a superimposed normal curve is shown in Output 4.19.2. The estimated parameters for the normal curve ( and ) are shown in Output 4.19.1. By default, the parameters are estimated unless you specify values with the MU= and SIGMA= secondary options after the NORMAL primary option. The results of three goodness-of-fit tests based on the empirical distribution function (EDF) are displayed in Output 4.19.1. Because the p-values are all greater than 0.15, the hypothesis of normality is not rejected.